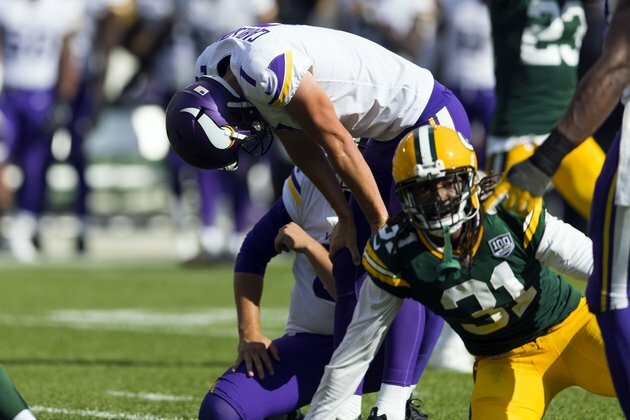 The Minnesota Vikings made a change in their place-kickers on Monday after a disappointing showing on Sunday. The Vikings waived Daniel Carlson on Monday, the team announced. Dan Bailey is expected to be signed, NFL Network Insider Ian Rapoport reported. "Did you see the game?" he said. "Yep, very easy," Zimmer said. Carlson had missed two field goals in the team's third preseason game, which caused some concern for Zimmer. Bailey was cut before the season by the Dallas Cowboys after spending seven seasons in Dallas. He has fielded several offers from NFL teams, and reportedly will sign on with the Vikings. Bailey has made 88.2 percentage of his field-goal tries in his career, which is the second best in NFL history, behind only Justin Tucker of the Baltimore Ravens. Bailey had a groin injury last season that caused him to miss four games. He made 75 percent of his field-goal attempts in 2017 and has missed two extra points.